The vehicle that pioneered the hybrid movement is still going strong. The 2014 Toyota Prius in Janesville, WI is bringing unmatched efficiency and innovation to drivers across the globe. When the Prius made its first appearance on the road, drivers weren’t necessarily sold on the vehicle’s capabilities. But after 14 years of unimaginable benefits to the environment, the Prius has proven that its performance capabilities are as strong as they originally promised to be. Since its launch in 2000, the Prius has saved over a billion gallons of fuel, and that number continues to climb with each new Prius purchase. From its powertrain to its design, the 2014 Toyota Prius performs efficiently with every drop of fuel and every cubic foot it possesses. The 2014 Toyota Prius runs on the Toyota Hybrid Synergy Drive system, which utilizes both a clean gasoline engine and an efficient electric motor. The system allows the vehicle to run on the engine, the electric motor or a balanced combination of both in order to provide more efficiency in each mile it drives. As a result, the 2014 Toyota Prius earns an Environmental Protection Agency (EPA)-estimated 51 mpg city, 48 mpg highway and 50 mpg combined fuel economy. 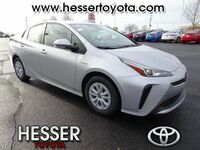 The Prius is also a certified Advanced Technology Partial Zero Emission Vehicle (AT-PZEV), which is made evident by the vehicle’s emission savings. Since its launch, the Prius has saved over 20 billion tons of CO2 emissions, making it one of the most fuel-conscious vehicles of all time. Since the Prius was released in 2000, the vehicle has grown to an efficient family of four. Now made up of the Prius, Prius c, Prius v and Prius plug-in, the quartet is doing its part to make the environment a lot greener. The original Prius was the champion for more efficient driving, but the automaker wanted to make sure efficiency was customizable and suited to a variety of driving needs. With the launch of three other Prius models, drivers can select the vehicle that best fits their lifestyle. The Prius c is the most affordable and compact member of the Prius family. The Prius v offers more passenger and cargo volume while also maintaining the Prius efficiency. The final member is the Prius plug-in, which operates in hybrid and electric modes to offer the ultimate fuel economy. For more information on the Prius and its three family members, contact the team at Hesser Toyota today.